This winter represents a milestone anniversary for Leicestershire-based manufacturer Schlüter-Systems. Master tiler Werner Schlüter established Schlüter-Systems KG in Germany in 1966, with operations following shortly in Germany, Turkey, Spain, Canada and, in 1993, in the UK. Far from being just another minor outpost in an international business, the UK business has had a whirlwind 25 years, getting stuck in to the country’s tiling industry at every level – from formulating standards, through to educating tilers on how to best use their products on the job. Initially operating out of one unit on an industrial estate on the outskirts of Coalville, the UK business has since expanded to incorporate three units and a workforce numbering over 50 people. This builds on a tradition of tile manufacture in Coalville that goes back nearly 200 years. Since setting up on these shores, the German manufacturer has had a considerable influence on British installation processes for tile and stone. With representatives sitting on The Tile Association (TTA) and a number of committees and working groups, the firm has established itself as a key contributor to British Standards for tiling, including the introduction of uncoupling membranes as a standard feature to maintain a crack-free covering. This added layer of technicality to the world of tiling, which for so long consisted of little more than sticking tiles to a substrate, has meant that the company has had to place significant emphasis on training and upskilling Britain’s tilers. The company takes every available opportunity to educate tiling contractors through training sessions, roadshows and an extensive programme of networking events. The company’s latest premises features a dedicated training facility consisting of smart seminar rooms as well as large practical areas with workstations. The centre plays host to twice-weekly training sessions, as well as a variety of other events supporting the business, local initiatives and national associations. Cementing its commitment to training and its position within the UK tiling industry, Schlüter has played a key role in setting up and defining the syllabus for tiling NVQs. 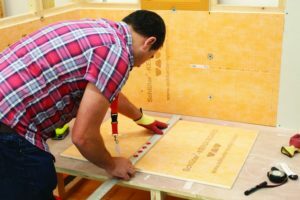 An attendee measures and cuts the waterproof tile backerboard Schlüter-KERDI-BOARD. BEKOTEC – a modular system allowing for the construction of lighter, thinner, deformation-free screeds. With the addition of heating pipes, the system becomes the wet underfloor heating system, BEKOTEC-THERM. DITRA-HEAT-E – an electric underfloor heating system with integrated uncoupling capabilities, preventing cracks and minimising floor height build-up. Such a wide range of products, which often depart radically from the norm, needs an equally impressive showroom to allow tilers to get hands on with the products. In fact, 2017 saw the opening of not one but two showrooms, in Clerkenwell, London, and The Application Gallery in-house at its Coalville headquarters. The Application Gallery is a key point of interest for many visitors to Schlüter’s headquarters. It consists of seven different pods representing different ideas for bathroom and kitchen installations, plus a preparation pod exposing a bathroom underlay. The Application Gallery is also home to a museum dedicated to the history of ceramic tile production in the local area. 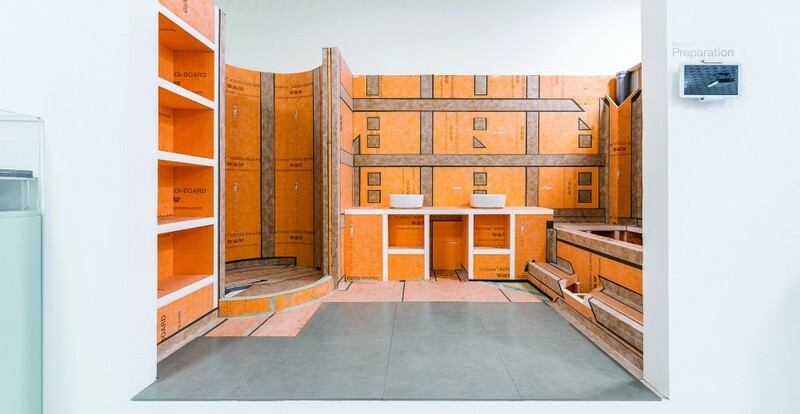 The headquarters of Schlüter-Systems, including the Application Gallery, are the focus of a new Google 360 Virtual Tour released by the company in August 2018. The tour can be viewed in a standard digital format and also in VR, courtesy of specially-branded Google Cardboard headsets.